My online pug friend Stella Rose Long http://stellroselong.blogspot.com/ has been nominating this blog for some awards lately. New to this whole blogging thing I wasn't sure if being nominated was the same as winning so I didn't know how to proceed, although I was very flattered. It seems these awards come with some rules so I'm going to try to follow them here. 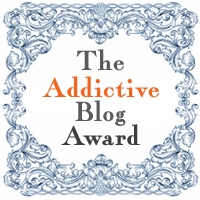 The most recent award bestowed on Pugs & Pics is The Addictive Blog Award and I have to admit that's an honor. As part of the protocol I'm supposed to explain how I got into blogging and then nominate 10 friends. Here's my story. I started this blog to share my photography, most of which involved pugs but also my nieces and nephews and soon my artwork. Then, I joined the Hubbard Hall Writers' Project, a group led by writer Jon Katz. Jon encouraged all of us involved to really grow and develop our blogs and with his direction I really began to define my interests and writing more regularly. I'm very pleased with all the response especially by fellow pugs and their owners such as Stella Rose Long and The Devil Dog. Now on to my nominations: 1. Your Mom is Strange http://yourmomisstrange.blogspot.com/ I have to confess that the blogger here is my sister-in-law but I am truly addicted to her blog. I love reading her daily growth as a new mom and being privy to the unique twists-and-turns of her creative mind. 2. Donna Wynbrandt http://donnawynbrandt.com/ I met Donna as another exhibitor at The Pig Barn Gallery Show. Her art is as unique and interesting as she is. She is just getting the swing of the blogging world, but her insights are priceless. 3. Full Moon Fiber Art. http://www.fullmoonfiberart.com Jon Katz's wife, Maria Wulf's site devoted to her art. Maria is a fiber artist but she is one heck of a writer, too and I freely admit I am addicted. 4. Picking My Battles http://pickingmybattles.com/ A fellow member of the Hubbard Hall Writers' Project and also a terrific artist and writer. 5. A Pound of Prevention http://poundofprevention.blogspot.com/ Another member of the Hubbard Hall Writers' Project, a doctor writing from experience. 6. Mersanger's Crossing http://merganserscrossing.wordpress.com Yet another member of our group. She writes about her father and his struggle with Alzheimer's 7. Raining Iguanas http://rainingiguanas.blogspot.com/ Yet, another group member. You have to love his positive spin on the world 8. Little House Home Arts http://littlehousehomearts.blogspot.com/ I met Jane at an art show and got to see her work firsthand. I love to check in and see what she is blogging about. 9. FolkwaysNotebook http://folkwaysnotebook.blogspot.com/ I started following this blog after she started following me and now I'm addicted. 10. Let Us Go Then http://letusgothen.net/about/ This blog is written by two friends and I love everything about it from its name, to the tales, to the photos.